Boil pasta in salted water according to package directions. Melt butter in large saucepan over medium heat. Sprinkle in flour and whisk and cook 2-3 minutes. Add in salt and pepper. Slowly pour in 4 c. milk whisking until smooth and heating to a low boil until thickened. Do not stop whisking and cooking until thick. Remove from heat. Grease a 9x13" baking dish and add the hot pasta to the dish. Over the top sprinkle 6 c. of freshly shredded cheese. 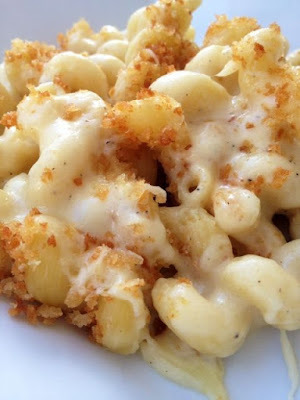 Pour the thickened cream sauce over the hot pasta and cheese and let it sit until the cheese melts. Stir everything together. Melt 2 T. butter over medium heat. Add in panko bread crumbs, stirring constantly 3-5 minutes or until golden brown. Sprinkle the breadcrumbs over the mac and cheese.